The dozen or more historical novels Miss Watson has laid in Great Britain and America are separate and complete — yet united by a family tree. They romp across four centuries, from 1582 London to 1892 Northern California. No one gets starring role twice — but main characters sometimes reappear in another book in a relatively minor role as grandparent, sibling, cousin, lover or even a wayward eyebrow. The predominant family trait seems to be producing and marrying strong-willed women. Though the protagonists range in age from eleven to adult, and some books are specifically juvenile and others definitely adult, the characterization, vocabulary, and plotting are appropriate to all ages from—say—eleven up. Spoiler Warning on Family Tree image below and in message from Sally. If you look at the list of titles and compare the chronology of the setting with the published dates, it might possibly seem altogether hodge-podge and random. 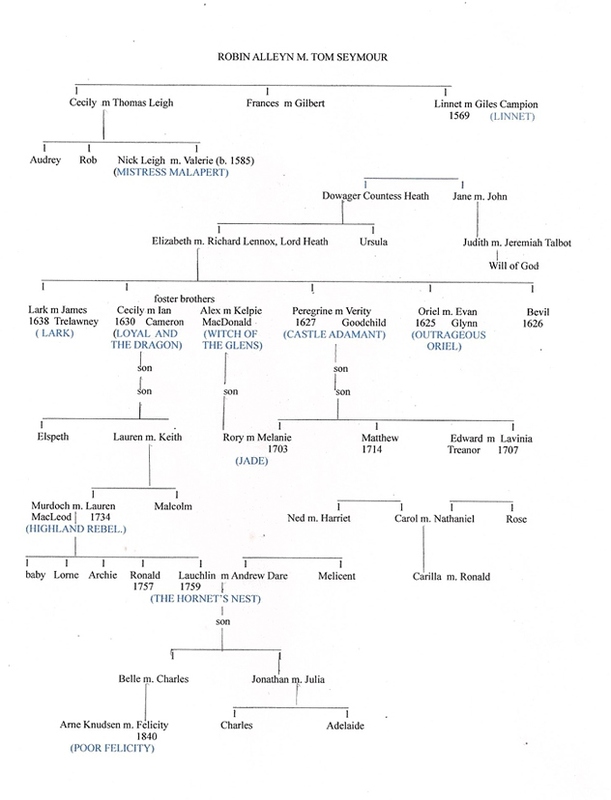 I never intended to write a loosely-connected Family Tree. However, although my house is chronically untidy, I have a very tidy mind, and while writing Lark, it dawned on me that it would be neat (in both senses of the word) to let the Nick and Valerie, protagonists in Mistress Malapert (1590’s) reappear with major roles as her grandparents (1651 or so). They had aged brilliantly. And speaking of Witch– That takes place in 1644, exactly a hundred years before Highland Rebel starts. So naturally, in a reverse link, Ian is a Cameron of Glenfern, and Lauren’s ancestor. Then Hornet’s Nest. Just a generation after Highland Rebel, so Lauchlin and Ronald are the children of Lauren and Murdoch, who are descended from Ian in Witch of the Glens. Now, what about Great-Uncle Matthew and Grandmother Lavinia from Hornet’s Nest? They were great characters. What fun to go backwards fifty years or so and put them in Jade as her younger brother and sister, with the same personalities then as later! Linnet was laid earliest of all, by a generation, and written last of the early batch. The best I could do there was a hint or two, to presage Valerie. And Poor Felicity (the revised edition is called The Delicate Pioneer) was laid about 75 years after Hornet’s Nest… Still, Felicity was clearly descended from them. Then I took about 30 years sabbatical. When I returned to the fray, it dawned on me that there was a lot of good material in the English civil wars which I’d hardly touched on, and I still hadn’t done Cecily’s Very Own book yet. And guess what I discovered! Lark had four older siblings, one being Cecily, of course: the others Oriel, Bevil and Peregrine. Peregrine? Good gracious, and hi, there! So now, remembering, I hauled it out, and approved. The characters were still good, and so was the beginning. So I got a wonderful judo friend in England to do the needful research and, as they say over there, Bob was my uncle. So though I re-wrote it entirely, I changed it virtually not at all, And this time it all came to life. And guess what? The Gypsy tribe who played quite a big role in Lark–? Here they were again, or rather, before: 8 or 9 years earlier! And Willow now a mere child of 8 or so–and every bit as shamelessly wicked as she turned out later! But before I quite finished that, I went on to Oriel. I found that now I was writing something between Adult and YA. A bit like some of Anne McCaffrey’s. And that Nick and Val’s daughter has married Richard Lennox, Lord Heath, of Gracewood Hall, Surrey. Outrageous Oriel was lots of fun–and possibly a bit shocking to a few–but times change, don’t they? That was Oriel, all right. Outrageous. (A very willful family they seemed to be.) It became another family reunion, with Granny Valerie and Grandfer Nick around, of course, and Lark as a two-year-old–and her spineless parents. Which left poor Cecily, still waiting for her book. Patiently. Well, it turned out she was nothing like my other heroines. Not in the least outrageous or willful. The perfect docile female. But her book (I forget the then-title) was the one intended to really tie them all together: Lark and Oriel, Peregrine, grandparents Nick and Valerie–and the characters from Witch of the Glens. It takes place in Oxford, with Cecily and Lark staying (because their parents can’t stand up to her) with their Grandmama The Dowager Lady Heath (also known is Madam Dragon). Ian and Alex with Lachlan are also there attending the university before going back to Scotland to take part in Witch of the Glens. Not a lot of action: it was a riveting conflict of personalities … Two of my own cats even walked in and took major roles! And it stalled. Balked. Wouldn’t finish itself. I yelled at the keyboard, “Well whadda ya want to do, then?” It sneered and wouldn’t say. I re-wrote it with some changes. No good. I went and brooded. And eventually it dawned on me. That poor, brilliant, doe-eyed, spineless child Cecily wasn’t up to the burden of protagonist in any plot–least of all one where Grandmama Dragon ruled! Uh-oh! How could I possibly have supposed she could? ‘Sorry,’ I muttered–and then into my head walked Loyal, a cheeky young servant who did not know her place and never would: who knew exactly what she wanted (“What’s freedom? ‘Tes choice!”) and proceeded to walk rough-shod over Lord and Lady Heath to get it. So of course she got sent to Madam Dragon… And the book, inspired (or brow-beaten) by Loyal, re-wrote itself. Bevil, the oldest son, may never get his book. I did try. He’s too full of himself, but not clever or even bad enough to be interesting. Madam Grandmama had picked out a wife for him, without consulting him or his father. Bevil didn’t care. The family tree chart ends with Felicity. Emily in The Haunted Schoolhouse is probably related to Felicity, who, forty years earlier, pioneered to Seattle even before it was Seattle. But I didn’t think to mention it. I did squeeze the family into The Angry Earth in a brief parenthetic paragraph, when Lauchlin, now a grandmother, is wakened by the New Madrid quake way over in Virginia. Currently I’m massively re-writing To Build A Land, (new title Return of the Exiles), for adults. Tremendously complex and driving me bonkers. Laid in Palestine back in 1947 when it’s busy trying to become Israel. You wouldn’t think it could tie that in, would you? One of the new adult protagonists from New York is half Jewish and half English. Her Mother, it turns out, grew up at Gracewood Hall, sister to the current Lord Heath, and also to Colonel James Lennox of His Majesty’s Colonial Forces in Palestine.